Looking for a firm organic mattress? Or a soft organic mattress? Or maybe a mattress with a firm support underneath, but a soft and comfortable top? Here is a guide to some of the firmest and softest mattress options that we offer. Firm Innerspring Mattresses: Our Sueno Tufted Organic Innerspring and our Royal Pedic Premier Natural Cotton With Wool Wrap Mattress are our two firmest mattresses. Both are made from organic cotton, wool, and untreated metal springs. These mattresses are best for people who like a truly firm, almost hard, feel to their mattress. These are also great mattress options for those who are not interested in a latex mattress. Firm Organic Latex Mattresses: Our most popular organic latex mattresses are customizable mattresses by Savvy Rest, Bella Sera, Green Sleep, and Sueno by Sleeptek. These layered mattresses allow you to choose firmer latex layers or softer latex layers, or somewhere in between. For example, the Savvy Rest Organic Serenity offers options to choose the firmnesses on each side of Queen and King mattresses. Choosing Firm for each of the three layers will give you a truly firm to hard feel. If you do not want a customizable mattress, the Royal Pedic Premier Natural Quilt Top Mattress (Royal Latex Organic Quilt-Top Mattress) or a Sueno 6 in natural rubber mattress are great, straightforward, very firm mattresses. Soft Organic Innerspring Mattresses: The Green Sleep Niu mattress is a pocket coil spring mattress with layers of coir (coconut fiber), natural latex, and wool encased in the gorgeous Green Sleep organic cotton velour. This is the softest innerspring mattress that we carry, as our other innerspring mattresses are generally very firm. If you do not want any latex in your mattress, but still want a softer feeling mattress, you can choose one of the latex-free innerspring mattresses listed in the above paragraph as “firm”, and add one or more organic wool toppers/pillowtops to create a softer feel. Soft Organic Latex Mattresses: Again, many of the organic latex mattresses we sell are customizable. Choose softer layers for a softer feel. For example, in the Bella Sera Nove 3, choose layers “Soft”, “Soft”, and “Medium” for a soft feel. Another very soft option is our Savvy Rest Organic Serenity with natural talalay. The natural talalay latex that Savvy Rest uses tends to feel softer than natural Dunlop latex. Also, as a general rule, the more latex you have, the softer the mattress will feel. With 10 inches of latex, the Sueno Euro 4 is our plushest base mattress (choose “Soft” for the top and middle layers and “Medium” as the bottom layer). For the softest organic mattress of all, choose a soft base mattress and add an organic mattress topper/pillowtop. 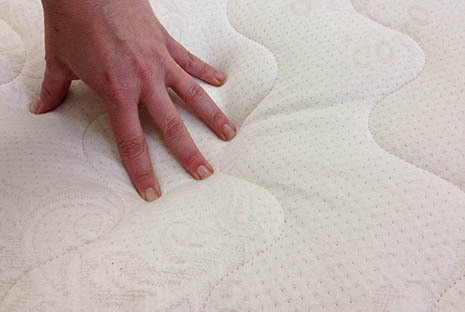 Read our blog post on choosing a mattress topper. Firm mattresses with a soft top (i.e. pillowtop): This is an option recommended for heavier people, or people who have back problems and need a firmer support. Choose a firm base mattress, which offers the needed support, and place a soft pillowtop on top for cushion and added comfort. A good example is the Bella Sera Nove 3 Pillowtop. You can choose firmer layers for the base mattress, such as “Medium”, “Firm”, and “Firm” and choose “Soft” for the 2” mattress topper.